Sara Runs This Weigh: Happy Global Running Day!!! 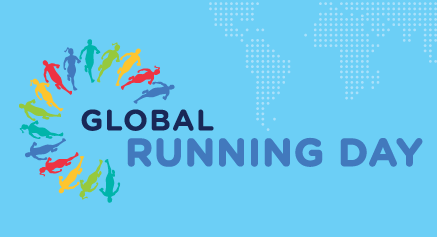 Today is Global Running Day. Did you run today to celebrate? Or did you maybe do something else active? Running isn’t all about running. Shocking, I know. But to be a decent/good/great/whatever runner, you need to have a strong body overall and JUST running can’t do that for you. If you want to avoid injuries you need to watch your nutrition and cross train and do strength training too. So, I’ve been doing pretty dang well with my nutrition for the last 4.5 weeks and I’ve also been making a point to do my cross training at the gym and at home and, now that it’s summer time, on the streets too by cycling! So, since I ran yesterday and am planning to run tomorrow to kick off not being able to workout at all (other than walking around the parking garage at work on breaks) as I’m working 16 hours tomorrow and Friday and then a shift on during my normal hours on Saturday, one of my days off. So, today, I hit the elliptical for 65 minutes and followed that up with some quality strength training. Now that it’s June, I added a second upper and lower body exercise to my workout. The other thing I did to celebrate Global Running Day today was to sign up for ANOTHER marathon. I think I need help. I was going to sign up for this one marathon that happens like the 3rd weekend in December, but that one isn’t happening this year (probably because they had a horrible turn out last year according to a friend of mine that ran it). So I thought that maybe I would run San Antonio Rock’n’Roll again. Well, RNR posted a Running Day special. $69 for this year’s marathon. I couldn’t resist. And then went ahead and made my hotel reservation for the historic Menger Hotel. Loved staying there last year so I’m really looking forward to staying there again this year! So, this will be my THIRD year running THREE marathons within a THREE month-ish time span. I do love the number 3. <evil grin> I’m not a marathon MANIAC for nothing! In the past, I’ve shared a few of my reasons for running. I’d like to ask you to take a moment and comment on this post and let me know some of your reasons for running! Cool! I'm signed up for RNRSA too! Or lunch afterward, but we definitely need a plan this year! oh yes, lunch afterward would be good too...somewhere airy! haha, my hotel is the menger, so i can shower quickly after. i still have your phone number unless you changed it, do you have mine still?